When I was young, my Uncle Ken Kenning, Aunt Eileen, Aunt Anna, and cousins Billy and Chrissy lived in Mercerville, NJ; their house was right next to a church. Because their driveway was fairly small, we always parked in the church parking lot when we visited. On April 22, 1971, that church exploded in a violent gas explosion that left nothing but part of the entranceway remaining. I was only six at the time, but I still remember my mother telling me that Uncle Ken’s house had exploded and that the ceiling had fallen in on my Aunt Anna, and that she had been taken to the hospital. (See Figures 1-4 below for the Evening Times article covering the explosion.) At least five people were injured, and many homes in the area damaged, with windows being shattered miles from the site. If the explosion had happened two and a half hours later, the church would have been filled with children. 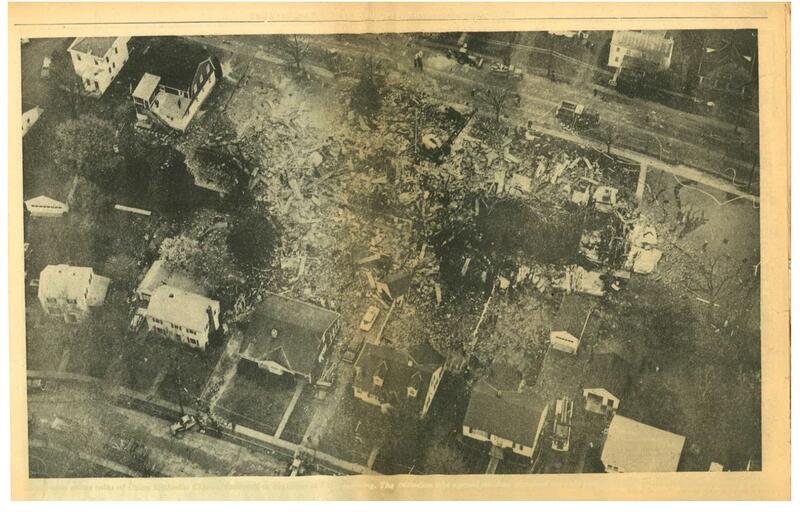 In Figure 3, the lower right picture shows the view of the rubble from my cousin Chrissy’s bedroom. This incident was very scary for me, a six year old. I didn’t understand how a building could just blow up like that, and I wondered if it would happen to our house. But I grew up and our house didn’t explode. (We didn’t have gas). Two things happened when I was in my early twenties. First, my 80 cubic foot scuba tank became a projectile one hot summer night in my bedroom, bouncing off all the walls, smashing everything in its path. It was the loudest sound I had ever heard, and not realizing what was happening, I was convinced that an airplane was about to crash through the window. I personally learned that night how powerful gas under pressure can be. The second thing that happened involved my Uncle Mike La Franco (my godfather), who lived in an apartment building in East Windsor, NJ. My father’s best friend, Uncle Mike was our closest and favorite, fun-loving uncle. One morning, he woke up and smelled gas. He called the appropriate number he had been given, but reached an answering machine. He waited a while and called again. Again he got the machine. He decided to get dressed and leave. He was in the bathroom when the building exploded. He managed to get outside, but he was burning, with even his hair on fire. My mother and I got the call from the hospital. He had burns that started on his head and went down his back, with more minor burns in other areas. At one point while in the hospital, Uncle Mike asked me to drive over to his complex and try to find his car keys in his apartment. I drove over, not sure what to expect, but what I found was nothing. Not only was his apartment gone, the entire building was gone. I wandered around the grounds, and found a couple of wall decorations that had been in my uncle’s apartment, but they were melted and deformed. When I asked him if he wanted me to search further, he said no. He didn’t want anything to remind him of what had happened. When I got married a few years later, I told my husband that I would never want a gas stove or gas heater or gas anything, and thankfully when we moved into our current house (my childhood home), there was still no gas service on our road. And then, in August 2014, we received a letter from PennEast, saying that our property would directly abut the pipeline route. And I knew that if this project was built, I would constantly have to live with the threat of our family being killed in a gas explosion. This fear was compounded when my cousin – the one who lived next to the church and who now lives in West Amwell, NJ – also received a letter from PennEast, saying that the line would go right through her property. While I understand Kim’s issues with natural gas I don’t quite share the same level of fear of it that she does. But as I’ve said in earlier posts, risks are not absolutes but must be considered as a continuum. And it’s not just about likelihood of disaster but the outcome in the unlikely event that the worst does happen. I could live with natural gas in my house (in fact I have a 500 pound propane tank for home heating). But that’s not the same as a billion cubic feet of natural gas going by your house every day, and having it forced on you by eminent domain.